Trump Calls for an End to Diversity Visas, Will it Happen? President Donald Trump has called on Congress to abolish the Diversity Immigrant Visa (DV) Program, through which the suspect in last week's New York terror attack entered the country. He called the program, informally known as the Green Card lottery, a disaster for the country. “This program grants visas not on a basis of merit, but simply because applicants are randomly selected in an annual lottery and the people put in that lottery are not that country's finest." "The idea that someone could just enter a lottery and in effect draw a U.S. citizenship out of a hat is not my idea of a good program.” Washington immigration lawyer Kenneth Rinzler agrees, but he says the problem is not vetting. “It’s not legitimate to use the recent terrorist attack to knock this program because they have to go through the same vetting as everybody else,” he says referring to the process the U.S. government uses to clear each applicant for immigration in the United States. Rinzler believes that there are concerns about all green card vetting; therefore it makes no sense to single out diversity visas. 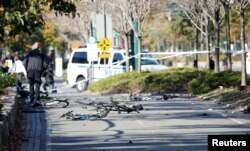 Uzbek native Sayfullo Saipov is accused of driving a rented truck down a crowded New York City bike path, killing eight people and injuring more than a dozen others. Investigators say Saipov told them he was inspired to conduct the attack by Islamic State videos. He faces federal terror-related charges. Multiple bikes are crushed along a bike path in lower Manhattan in New York, NY, Oct. 31, 2017. Saipov is the fifth DV program beneficiary to be connected with a terrorist attack in the U.S. since the program was started in 1990. The program grants 50,000 green cards a year to countries with low immigration rates to the United States, mainly from Africa and Eastern Europe. In 2003, after the 9/11 terrorist attacks, the State Department Inspector General raised concerns that aliens from countries designated as state sponsors of terrorism can apply for diversity visas. But in a 2007 report, the Government Accountability Office concluded that the DV program isn’t so much a threat to U.S. national security, as it is open to fraud by and against applicants. 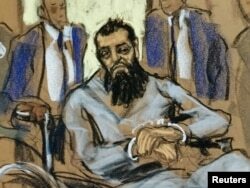 Sayfullo Saipov, the suspect in the New York truck attack, is seen in this courtroom sketch appearing in Manhattan federal courtroom in a wheelchair in New York, Nov. 1, 2017. Trump's comments sent shock waves through countries where the DV program is seen as a ticket to the American Dream. Yet, a proposal to end the lottery visa is already in the Senate, included in immigration reform legislation introduced earlier this year. A White House official, speaking on background, told VOA that "ending the diversity [visa] lottery program was already part of the immigration reform principles the White House submitted to Congress, and is included in the RAISE Act, which the president has endorsed." Reforming American Immigration for Strong Employment Act (RAISE), sponsored by two Republican senators, has been in the Senate Judiciary Committee since February of this year, awaiting mark-up. Similar legislation was introduced in the House Judiciary Committee in September. The Chair of the House Committee, Bob Goodlatte said in a Fox News interview that the program makes no sense. “Here we are admitting 55,000 people a year into this country — based upon job skills that are needed in the country. Not even based upon family they have in the country, but based on pure luck,” said Goodlatte. "I think those visas could go to better purposes," Rinzler said, "everything from clearing the backlogs of years that we have with many countries, to giving them to everybody from the interpreters and translators in Iraq and Afghanistan that the U.S. government made a commitment to and then didn’t deliver upon, to military people who are having trouble nationalizing now." But a Detroit-area lawyer who leads a Muslim advocacy group told AP, eliminating the program would be a strike against diversity. "Diversity has always been what has allowed us as a country to stand as a beacon of hope and a beacon of strength and a beacon of resolve. And any call, political or not, to really close that door and to really extinguish that flame of diversity to the world is troubling," Fatina Abdrabboh, Director of American Muslim Advocacy League told AP in an interview. "The ending of this program certainly, I think, would be a symbolic defeat and loss in terms of our standing, really, with the whole world." While the Republican Party is seen as being in favor of getting rid of the diversity visa program, Senate Democrats in 2013 supported a bipartisan bill that would have abolished it. The effort failed, however, when the House did not act on the legislation. Applications for the 2019 DV are being taken now through November 22. Applicants will learn next May if they have been selected - unless there is a change in the program's status. But it is the people who were selected for 2018 who are really worried. Will they be able to come or not? Whether the Congress will take up the issue any time soon, depends on many factors, including political ones such as the Russia investigation and other priorities for the administration. Katherine Gypson and Peter Heinlein contributed to this report.